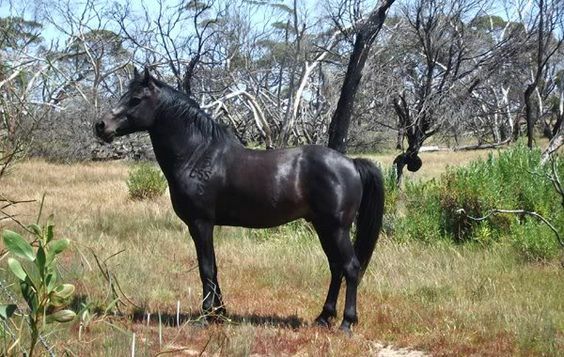 The Coffin Bay Pony is considered to be a semi-feral equine breed indigenous to the Coffin Bay region, of Australia. People seem to confuse them often with another famous Australian feral breed, Brumby that dwells in the wild. However, this breed does not have the same lineage as the Brumby and live in a fenced area. The origination of these ponies can be dated back to the middle part of the nineteenth century when a British settler named Captain Hawson reached the Happy Valley region of Australia along with his family. He had brought along with him sixty Timor Ponies purchased in Indonesia. He went ahead and established a stud farm, with these ponies being his basic stock, aptly suited to thrive in the warm climate. As there was an expansion in his company, he got another strip of land at the Coffin Bay Run, shifting these ponies there in the year 1847 also breeding them in the semi-wild though in a controlled way. In 1857, W.R. Mortlock purchased the Coffin Bay Run and was more interested in importing bigger ponies and horses instead of investing much on the Timor Ponies. 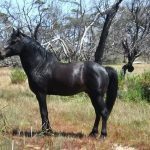 The horses which he imported were bred with the Timor breeds for the purpose of producing larger animals, which later attained the name Coffin Bay Pony. Other horses that were said to have an influence in this breed’s development include Arabian, Welsh Cob and Thoroughbreds, Hackney, and Clydesdale. Finally, in 1927, the stud was sold off by Mortlock’s descendants to Martin Cash, before which its management was in complete disorder. The horses were neglected too as breeding horses was no longer considered to be a profitable business. The wild, untamed ponies increased in numbers posing as a significant problem to the new owners. Thereby, most of them were culled or even killed to bring in a reduction of their numbers. There was a change in ownership again in 1932 when the Coffin Bay Run was taken over by the Morgan family, who saw a prospect in these ponies thus began selling them. With the cost of diesel rising, the importance of these ponies as working and farm horses increased again. Therefore, a small number of the semi-feral herd was gathered by the Morgan family and sold off to markets in Port Augusta. As things got more mechanized post the Second World War, there was once again a decline in the demand for these ponies and Moss Morgan, the owner of the farm then, went on to train some of the Coffin Bay Ponies, further selling them in the market as “riding ponies”. When Geoff Morgan took over the farm in 1972, he handed it over to the South government of South Australia to transform it into a national park. His purpose for doing the same was to safeguard and protect the herd. Even after the place was declared as a National Park in the year 198, the ponies still continued living there but were considered as feral breeds managed on land for the purpose of conserving native species. As the ponies were causing damage to the area within the premises of the national park the NPWS (National Parks and Wildlife Services) launched a program with the purpose of eliminating these ponies from the park. 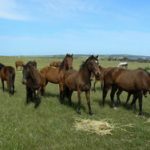 However, a group of locals were against this decision and came together to form, the Coffin Bay Pony Society, a nonprofit organization whose motive was to retain the ponies in the park. As it was of a great historical value, there was an agreement between the NPWS and Coffin Bay Society in the year 1991 where a mob of about twenty mares, a stallion as well as their foals were permitted to reside in the park. However, to avoid the increase in the number of ponies, they would be mustered on a yearly basis and auctioned off. A predetermined amount of the price would be used up by the National Parks and Wildlife Services for the purpose of land management while the remaining money went to the Coffin Bay Pony Society. In 1999 a decision was again taken by the government to move the ponies from the park but was compelled to compromise on being opposed by the public in 2003. Hence, rather than being eliminated, they were relocated to a different strip of land jointly purchased by the State Government as well as the Pony Preservation Society. This new home, located near the Coffin Bay Stud was known as the Brumbles Run, and about 40 ponies were shifted to this place on the 29th of February, 2004. 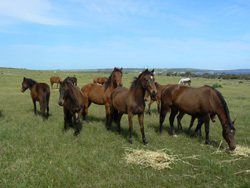 At present, the Coffin Bay Ponies stay here and have minimum contact with people. However, they may be looked at from a vehicle which may be arranged by the preservation society. They are mustered, handled and auctioned every year.